There is a number of interesting markings on the Feld-Hell machine and its carrying case. 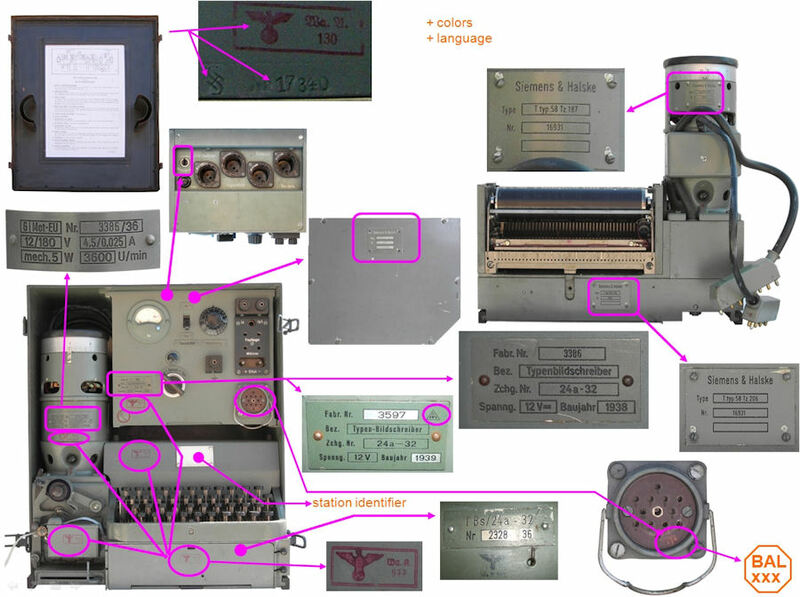 First of all, there are up to seven "Typenschilder" (data plates, labels, plaques, asset tags) on the various units that make up the Feld-Hell system: the electronics box, the motor-generator, the keyboard-character-drum unit, and the base-unit. The latter unit is the "Unterteil" that comprises the gearbox and the paper trays. These plates typically indicate the serial number, year of manufacture, and a drawing number. It is unusual to find this many plates on a single piece of equipment. On the one hand, it may reflect the modular design, on the other that various modules were built or assembled by several companies. 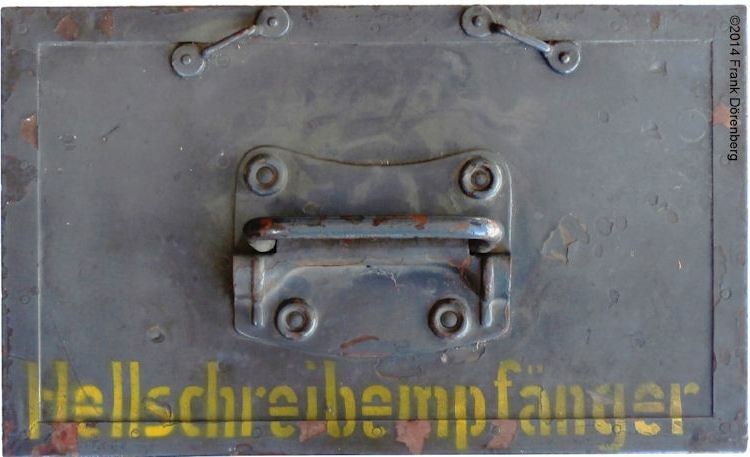 As the Feld-Hell was manufactured for the Wehrmacht, the machine and its carrying case normally have one or more Waffenamt acceptance stamps. Stamps have often been removed post-war by the new owners of the equipment. This may have been done in compliance with laws against the (public) display of Nazi symbols, or to avoid any suggestion of support of the associated ideology. The removal often leaves - still visible - rub marks where the stamps used to be. An other characteristics of interest is the color of the various units of the Feld-Hell set. The standard military colors are shades and hues of drab (e.g., "feldgrün", "olivgrün"), and light and dark blue-gray ("dunkelgrau"). Original colors are compliant with the official color palette ("Farbtabelle") of the Reichs-Ausschuss für Lieferbedingungen (RAL) - the German State Commission for Specifications. The RAL was founded in 1925 as an initiative of the German private industry and the German government. The purpose was to standardize specifications of, e.g., colors, and hence promote industrial rationalization. In 1927, the RAL defined a table of 40 colors. It was successively revised and expanded to the current list of 210 colors. After several years, the name was expanded to "Reichsausschuß für Lieferbedingungen und Gütesicherung", to address quality control aspects. Since 1980, the RAL activities are managed by the "RAL Deutsches Institut für Gütesicherung und Kennzeichnung e.V." Note that the some of the original color numbers have been retained, though the associated colors have changed. So, today's RAL color numbers do not correspond to those from WWII with the same number! Some post-war owners have felt it necessary to repaint their Feld-Hell machine - few have managed (or bothered) to accurately recreate the original color. One also comes across Feld-Hells that have been repainted in completely different colors. As a result, the set may have a mix - not only of serial numbers, but also of colors. Due to maintenance and repair, many Feld-Hell sets have had one or more units replaced. The discussion below is based on photos and other information that I have collected so far on surviving Feld-Hell sets. The diagram below shows the drawing tree of the Feld-Hell set. The drawing numbers appear on labels of the main modules. No such labels have been found on the keyboard-drum module or the printer-module. Legends around the switches, the volume control, and on the rectangular connector block for phone line, radio receiver, and electrical power. Waffenamt acceptance stamp, usually placed right below the equipment plate to the left of the main switch. In very few cases, the stamp is placed just above that plate. the 2-digit year of manufacture. T Bs, which is short for "Typen-Bildschreiber", i.e., a Hellschreiber. This is followed by the drawing number 24a-32. S-H-Feldschreiber where "S-H" stands for Siemens-Halske. Baujahr: the 2- or 4-digit year of manufacture. Telescrittore SH, on machines made for the Italian army. In my database, there are only two Italian machines, both from 1941. 24a-32a2 (in my database, on several machines from 1940 1944). There appears to be a correlation between "a2", and absence of the 12-pin round connector on the front of the amplifier box. The Wehrmacht maintained a long list of "Zeichnung Nummer" for equipment that was not "commercial off-the-shelf", as we call it today. The list ("Gerätliste (Heer)", ref. 32), includes prototypes for which design drawings were available - independent of whether the equipment ever entered service! Each Zeichnung Nummer has two parts. First the identifier for the "Stoffgliederungsgruppe." This is the category of equipment: weapons, munition, technical items, vehicles, etc. The category "24" refers to "Nachrichtengerät": communications equipment. The suffix "a" refers to the sub-category ("Untergruppe") for "Drahtnachrichtengerät": equipment for wired-communication, such as teleprinters (Fernschreiber) and telephones (Fernsprecher). The category number is followed by the "Gerät-Nummer". Here: "32". This is a consecutive numbering of the items within the sub-category. This "Gerät-Nummer" is not to be confused with the "Gerätenummer" (serial number) on the label. All Gerätnummer were compiled in several extensive "Gerät-Listen" binders, that were updated every year. The binders with the individual "Gerät" sheets were supposed to be kept up to date by discarding (destroying, as the lists were secret) superseded sheets and replacing them with the updated sheets. Ref. 32, 33. Note that the lists do not include the actual design and assembly drawings. Fig. 7: decomposition of the drawing number "24a-32"
Another example of a drawing number is 124-1425 A. Contrary to 24a-32, this is a Luftwaffe drawing number. It refers to a "Spezial-Hellschreiber" that was part of the "Bernhardine" on-board radio-navigation system. A number of boxes built by Siemens-Halske during the period 1940-43 have T. typ. 58 d in the drawing number field of the data plate (see Fig. 6 above). This is actually not a drawing number but Siemens-Halske's own designator for the Feld-Hell. Not surprisingly, the Fig. 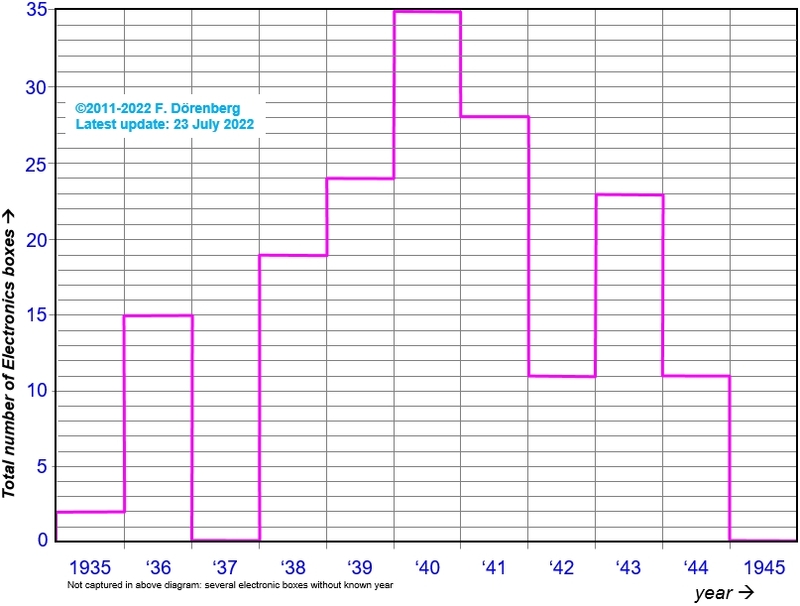 10 above suggests that the production volume surged towards 1940. That may correspond to equipage of an increasing number of Wehrmacht Signal Corps units for the invasion of France and the Low Countries. After those invasions, the production effort the German arms industry was clearly scaled back, even though planning for the invasion of the Soviet Union ("Unternehmen Barbarossa", Operation Barbarossa), was already in progress. That invasion started mid-1941. The hard-fought German defeat at Stalingrad in January of 1943 was a turning point, and the German retreat started after the Battle of Kursk during the summer of 1943. In parallel, the Tunisia Campaign ended with German surrender in May of 1943. This meant that during 1943, Wehrmacht Signal Corps units had to be re-formed and equipped. This may explain the production surge in that year. The photo below shows a data plate with two small areas where a marking has been carefully removed with a tooling bit, and then painted over with the original color. There are several such plates in my data base (in the diagram above, they are included in the green line). These are not post-war modifications. The area to the right of the serial number may have had a manufacturer's identification marking. However, it is not at the spot where the Siemens-Halske and Mende markings are normally found. The area after the "24a-32" drawing number may have had an additional suffix. Removal of these markings (esp. manufacturer's identification) is not unusual on equipment built during and after 1943, in particular on airborne equipment of the Luftwaffe - deemed most likely to fall in the hands of the enemy. In 1943 it was decreed that equipment (incl. the plates) should no longer bear the written name or logo of the manufacturer. Rather than throw away already manufactured plates, the markings were simply removed and painted over. Note that on this particular plate (and several others in my database) the type-suffix "a2" is handwritten after the type designator "Feldfernschreiber". Siemens-Halske outsourced the manufacturing of some Feld-Hell parts and subassemblies. 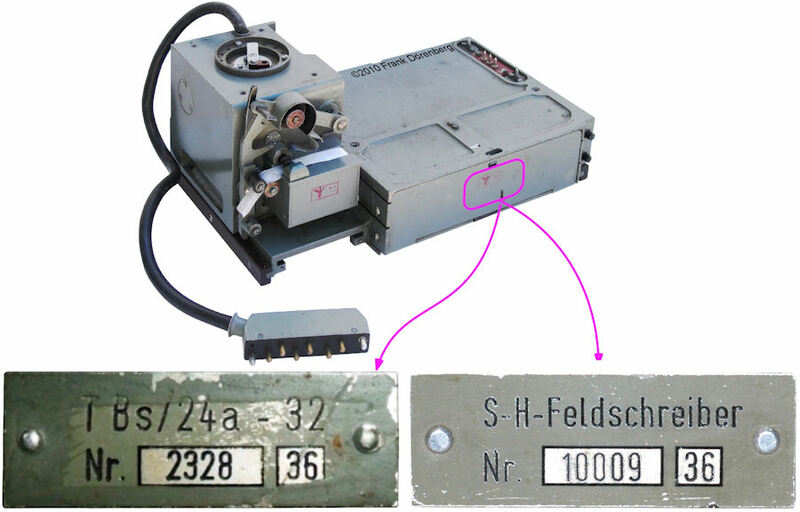 As shown in Figure 9 above, many of the Feld-Hell electronics boxes were made by Radio H. Mende & Co. GmbH in Dresden (ref. 15, 21). This is indicated by the triangular Mende logo to the right of the serial number. During the years 1941-1943, Mende produced around 1400 Feld-Hell machines a year (see the table on p. 47 in ref. 15; 4382 in total). In my database, the earliest Feld-Hell with a Mende-built electronics box, has serial number 0053 and dates back to 1936. Later Feld-Hell units made by Mende no longer have the company logo, but have the Fertigungskennzeichen ("secret" manufacturer's code) "bl". These two- and three-digit codes ("Herstellerkürzel", manufacturer abbreviations) were introduced by the Waffenamt starting around 1939/40. The list eventually comprised codes for over 9000 manufacturers (ref. 19). Some products from Mende Co. have the code "cw". The Rudolf Hell company had the code "cmw" (ref. 20). 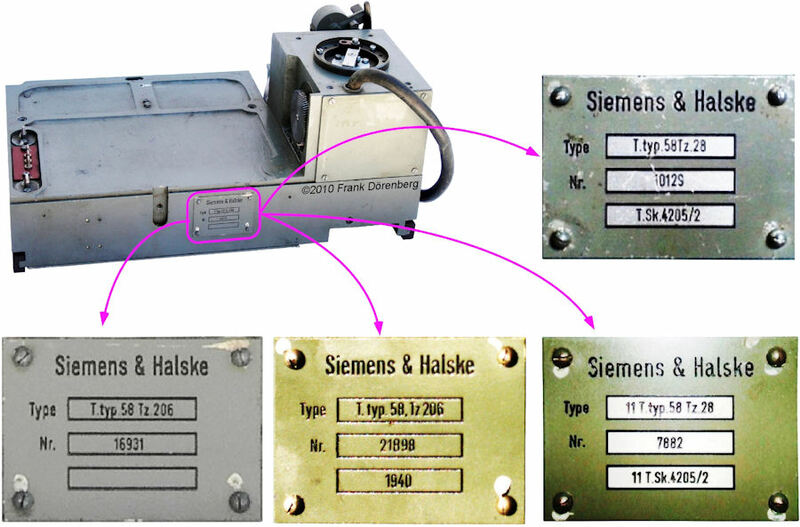 Note that none of the plates of Siemens-Halske-built Feld-Hell boxes have a Siemens code. 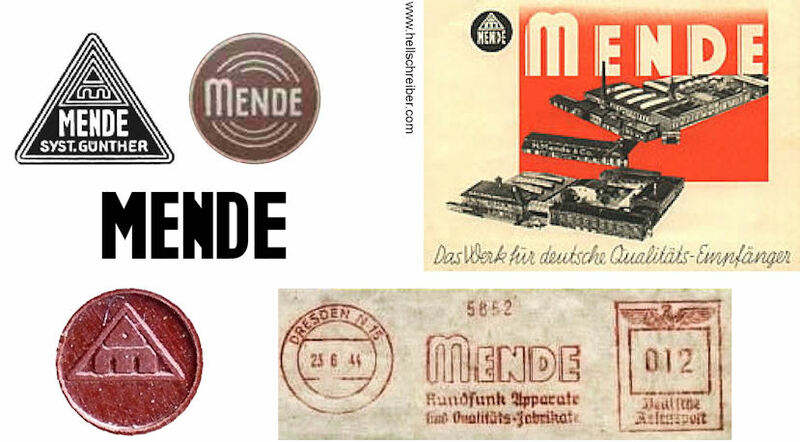 The Mende company was founded late 1923 by Otto Hermann Mende and Rudolf Müller as the general partnership "Offene Handelsgesellschaft H. Mende & Co." Early 1938, the company structure changed to a limited partnership ("Kommanditgesellschaft", KG). By then, they had sold a million "household" broadcast radio receivers, some under license from Philips N.V. Some broadcast receivers were used by the military, e.g., installed in submarines such as the U432. In 1935, Mende started production of teleprinters, transmitters, receivers for the army (Heer) and bomb fuses for the Luftwaffe. This included the Feldfernschreiber, Feldfernsprecher (field telephone), and Feldverstärker (field phone line amplifiers). By the end of the war, it had also produced some 25000 Tornister -Empfänger "b" (Torn.E.b.) receivers. Ref. 21. Fig. 12: the 1930s letterhead of Radio H. Mende & Co. G.m.b.H. Mende's in-house capabilities covered everything required - other than radio tubes - for the manufacture of wired and wireless telecom equipment: tool & die making, machine building, coil winding (inductors, relay solenoids, transformers, motors), compression molding (e.g., Bakelite parts, and mipolam (a trade name for PVC, which was invented at Chemische Fabrik Griesheim (CFG) in the early 1900s) cases for type 2B38 lead-acid batteries), etc. Ref. 9. Mende hardly engaged in product development. The Russian occupational forces dismantled the factory during 1945-46 (ref. 26), and moved it to Russia. In 1947, the founder's son, Martin Mende, created North German Mende Broadcast GmbH in Bremen, later renamed to NordMende. It manufactured household electronics. See ref. 11, 23, 24, and 25 (pp. 50/51/58). Outsourcing may have been to optimize production capacity utilization at both small and large companies, or geographical distribution to reduce vulnerability during a potential war situation. Note that the Heereswaffenamt (and the Technisches Amt of the Reichsluftfahrtministerium (RLM, the German Air Ministry) fully controlled contract awards to prime suppliers ("Leifirmen", "Lieferer") and their sub-contractor companies ("Unterlieferanten"). This covered development and production, system assembly, subassembly, spares parts production, and manufacturing under license. Cf. top of p. 19 and bottom of p. 49 in ref. 1. Licensee companies received all required design documentation, and paid license fees. 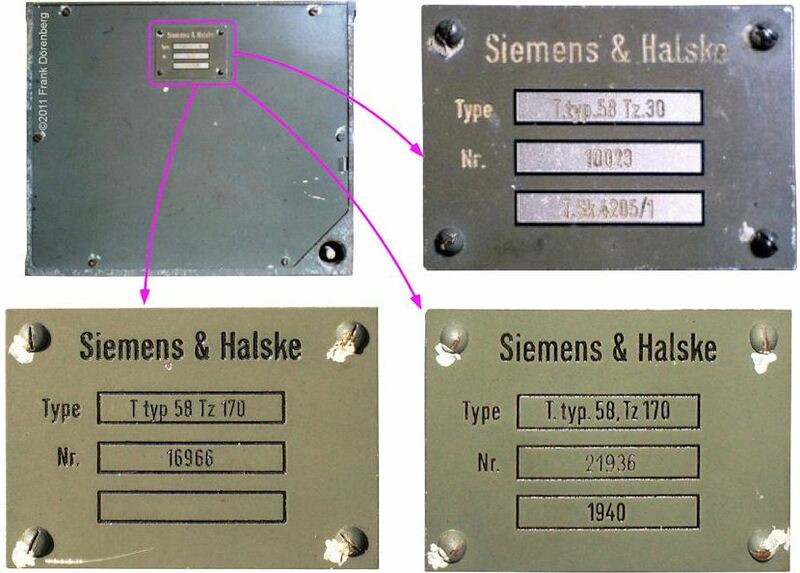 In 1938 and beyond, it appears that all Siemens-Halske data plates have a 4-digit year of manufacture. 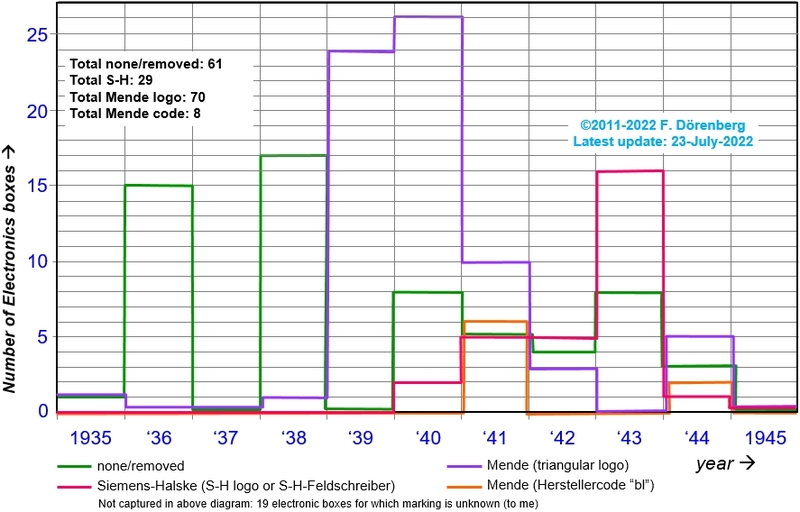 Mende appears to have changed from 4 digits to 2 digits, around the same time that they replaced their triangular logo with their 2-digit manufacturer's code. The third field is not labeled. It is primarily used to mark the year of manufacture or the number of a design drawing. With one exception, the designator is always the Siemens-Halske designator for the Feld-Hell, followed by a sub-assembly drawing number (Teilzeichnung). That is: T. typ. 58, Tz 170. On some plates, there is no comma between the Feld-Hell root and the drawing number (i.e., T .typ.58 Tz.170), or there are no punctuation marks at all (i.e., T typ 58 Tz 170). One of the plates in my database has Tz. 30 instead of Tz 170, and outline drawing number T.Sk.4250/1 (Teil(e)-Skizze) in the third field. 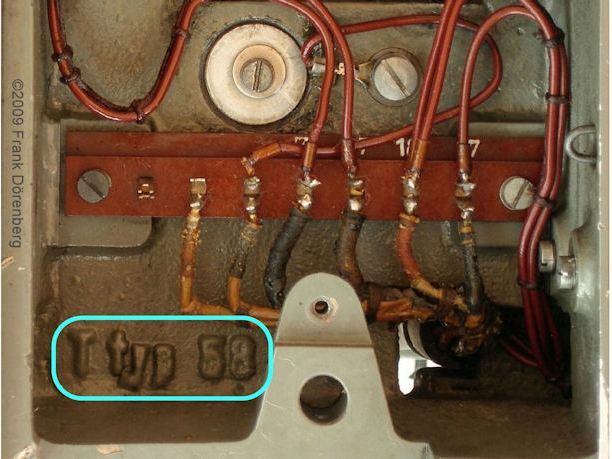 Note that the latter drawing number is also found on the data plate on the rear of some motor-generators. In none of the cases in my database does the serial number on this rear data plate match the serial number on the front plate of the same electronics box. Language. The switches, volume control and the bakelite connector block of are normally labeled in German. The legends for the switches and the volume control are small plates that are attached with screws. "Tonsieb 900" is "filtro 900"
There are also machines with legends in other languages, notably Czech and Finnish, see photos below. However, I have not been able to determine if these modifications where made during the war. The detachable legend plates sometimes have the original German version on the back side. Note: the Finnish army overhauled their Feld-Hell machines in the 1950s and re-painted a number of them bright green. All Feld-Hell motor-generators ("dynamotors") have a data plate on the front. Some also have one on the back. G | Mot-EU. In this designator, "G" stands for "Generator" and "Mot" for Motor. "EU" stands for "Einankerumformer". That is, a "single-rotor converter": the windings of the motor and of the generator of this DC-DC converter are wound on the same rotor. A = motor input current / generator output current rating: 4,5 / 0,025 A.
W = mechanical dissipation/power. Presumably this is the power available to drive the gearbox: mech. 5 watt. Of all the motor-generators that I have been able to document, only one has a manufacturer's marking on the front: a colored (!!) Mende logo. Type - the equipment designator. In all cases, this field has "T typ 58" (the Siemens-Halske designator for the complete Feld-Hell set), followed by a detail-drawing ("Teilzeichnung") number "Tz.187" or "Tz.31"
The year of manufacture indicated on the rear plate typically does not match the year on the front plate of the same motor-generator! For instance: 1940 vs. 1936. Also, the serial numbers on the rear plate do not match the numbers on the front plate. For instance: 16931 vs. 3386, 17208 vs. 3962, 17378 vs. 3704, 4268 vs. 11063. I have no explanation for this. Very few Feld-Hell machines have an electronic box and a motor-generator with the same serial number. Even if they left the factory with identical serial numbers, units may have been swapped out for maintenance reasons, or incomplete machines may have been combined after the war. Interestingly, electronics boxes and motor-generators that do have the same serial number, typically do not have the same year of manufacture - sometimes as much as four years apart (e.g., S/N 4618)! The base-unit ("Unterteil") is the part of the machine that contains the gearbox and the paper cassettes. It is the base for the motor-generator, printer module, and the keyboard/character-drum unit. There are up to two data plates on the base unit: one on spring-loaded cover of the paper cassettes, the other one rear of the unit. Most Feld-Hell sets have neither of these plates, some have one, a few have both. The data plate on the front of the unit has the type designator; Below it are two fields, one of which is labeled "Nr." (serial number). Next to the serial number is the 2-digit year of manufacture. The type designator is either "S-H-Feldschreiber" (Siemens & Halske), or "T.Bs." = "Typen-Bildschreiber" (i.e., Hellschreiber), followed by the drawing number 24a-32. If the first field contains the drawing number "Tz. 206", then the third field is either empty, or contains the 4-digit year of manufacture. If the first field contains the drawing number "Tz. 28", then the third field always contains "T.Sk.4205/2" (Teil(e)-Skizze). Sometimes both are preceded by "11" (significance unknown). Interestingly, both "T.Sk.4205/2" and the prefix "11" also appear on the data plate on the rear of some motor-generators. H = Heer (army). On the "Original telegrams" page, there are several Feldhell-telegrams from or to stations such as HMIX, HLCXC, HZDX, HFDX, HDAXD, HORXD, HKEX, HWEX, and HFADX. The Reichsschule-SS for female auxiliaries in Oberenheim/Alsace started using the callsign "HSOM" in November of 1943 (ref. 28). L = Luftwaffe (air force). Examples: LFRF (Funkberatungstelle of the Luftwaffe test center at Rechlin near Berlin) and LYKJ (Oslo-Kjeller, Norway); see p. 27 in ref. 34. M = Kriegsmarine (navy). Example: MSTF. W = Oberkommando der Wehrmacht (OKW; supreme command of the armed forces). Examples: see Fig. 26 below. There also appear to have been call-signs that start with "R". I do not know what the "R" stands for. Second & third character = "Ort der Dienststelle für die die Fernschreibstelle arbeitet" = the location of the service to which the teleprinter station belongs. 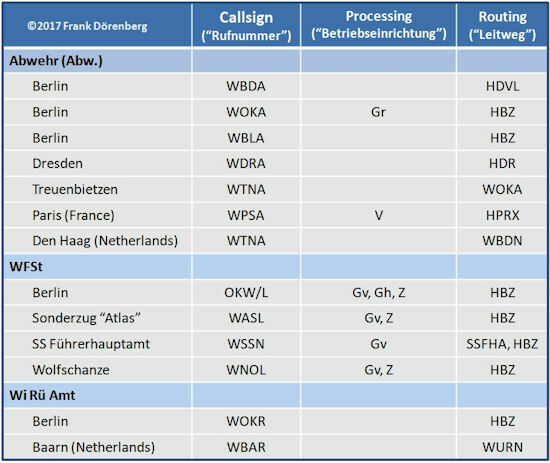 L = "Fs-stellen des WFst" = teleprinter stations of the Wehrmachtführungsstab operations staff of the OKW. N = "Fs-stellen Ag / WNV" = teleprinter stations of the Amtsgruppe Wehrmachtnachrichtenverbindungen telecom/signals directorate. P = "Fs-stellen W Pr" = teleprinter stations of the Abteilung für Wehrmachtspropaganda propaganda department. R = "Fs-stellen Wi Rü Amts" = teleprinter stations of the Wirtschafts und Rüstungs Amt office of economics and armament. S = "sonnstige Fs-stellen des OKW" = other teleprinter stations of the OKW. X also appears to have been used, but I do not know what it stands for. Some labels have a fifth character, e.g., HDADX, HORDX, HFADX, and HLEX5. Gr = "Schlüsselfernschreibmaschine (Geheimschreiber) SFM [ = Schlüsselfernschreibmaschine] T52" = Siemens teleprinter model T52 with integrated cypher/crypto function. Gh = "Geheimzusatz a/A" = cypher/crypto teleprinterattachment (between teleprinter and line) model a/A. 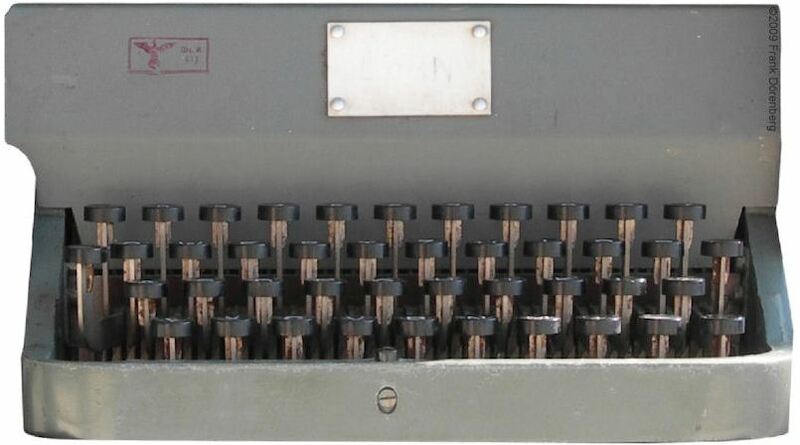 Z = "Geheim-Zusatz 1940" = cypher/crypto teleprinter-attachment (between teleprinter and line) model Lorenz SZ-40. The prefixes Gr, Gh, and Z were used to indicate the required processing at the receiving teleprinter station. "Feldfernschreiber für Drahtbetrieb" (Hellschreiber for wired operation), followed by the abbreviation "TBs" ( = "Typen-Bildschreiber") and the standard Feld-Hell drawing number "24a-32". 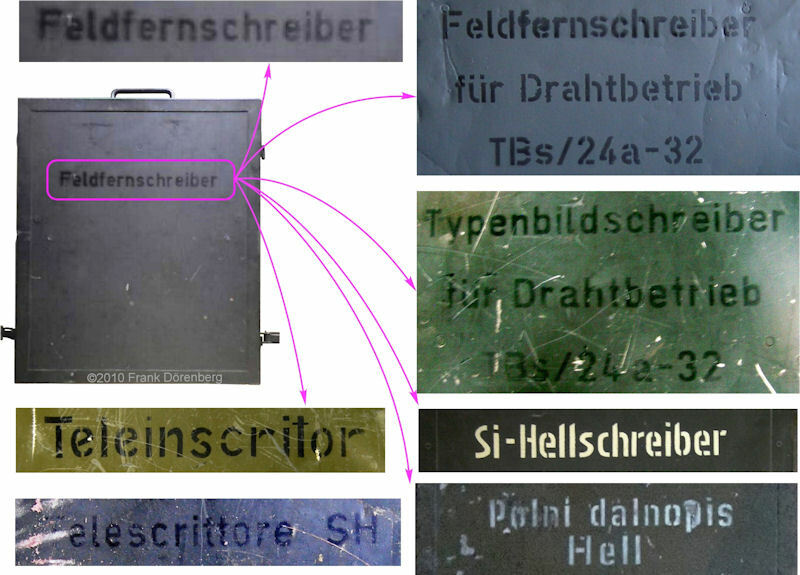 "Typenbildschreiber für Drahtbetrieb", also followed by "TBs / 24a-32"
The Italian army also used Feld-Hell machines (see this telegram). The cover of the carrying cases are marked with "Telescrittore SH". This is short for "Telescrittore Siemens-Hell per uso campale", i.e., Siemens-Hell field-teleprinter. Some lids have a serial number and a Siemens-Halske logo (though S-H was not necessarily the manufacturer of the machine, nor of the lid or the case). On the bottom of the inside of the case, there is a cast-metal locking mechanism for the base unit of the Feld-Hell machine. In some cases, this cast plate has the identifier "Ttyp58d g" or "11Ttyp58d g", where "T typ 58" is the generic Siemens-Halske designator of the entire Feld-Hell set. 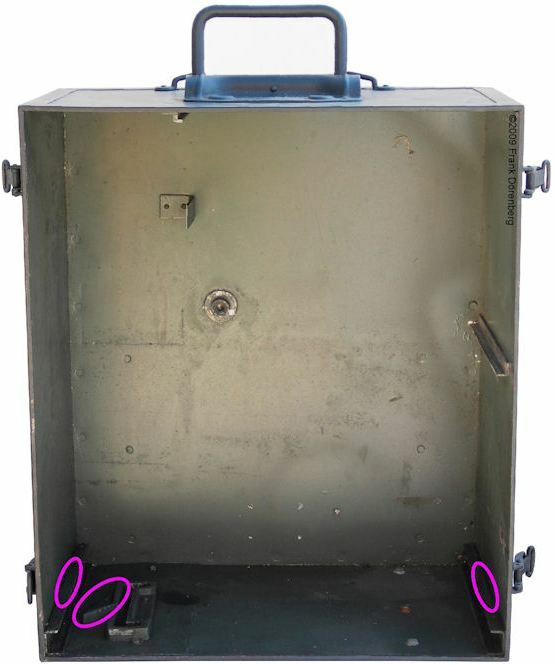 On the left and right hand side of the bottom of the case, there is a U-shaped metal channel. It is the track for the slides on the bottom of the machine. One of these channels often has the entwined S-H logo of Siemens-Halske, and a serial number. Fig. 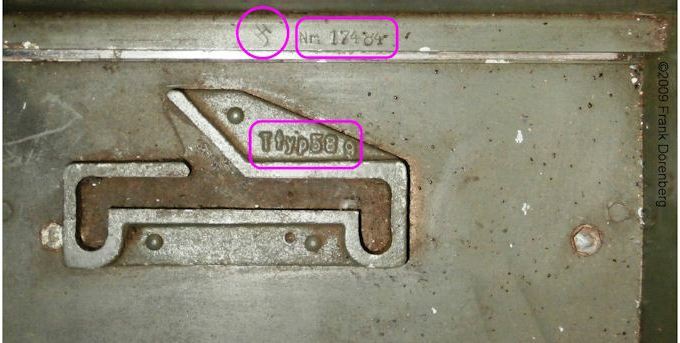 34: "Ttyp58 g" on the casting of the locking mechanism and Siemens-Halske logo with "Nr 17484"
Fig. 35: no marking on the casting for the locking mechanism but S-H logo, and serial number without letters "Nr"
The "Law of the Creation of the Provisional Reichswehr" of 6 March 1919 ("Gesetz über die Bildung einer vorläufigen Reichswehr") dissolves the "Heer", and forms a Provisional "Reichswehr", to protect the national borders, and to maintain law and order. Per §1 of the "Wehrgesetz" (defence law) of 23 March 1921, the "Reichswehr" consists of the "Reichsheer" (Army) and the "Reichsmarine" (Navy). It also abolishes conscription (compulsory military service). Per §2 of the "Wehrgesetz" of 12 May 1935, the Wehrmacht consists of the "Heer", "Kriegsmarine", and "Luftwaffe"; §1 of that same law reintroduces conscription. The Wehrmacht surrendered unconditionally on 8 May 1945. However, some units (e.g., in Norway, and forces used for police activities under Allied command) remained active until the end of August 1945. The last unit to surrender was a dozen soldiers of the Navy Weather Service, that were "forgotten" on an isolated island (Nordaustlandet) of the Svalbard archipelago in the Arctic Ocean (ref. 31). The Wehrmacht was officially abolished a year later, 20 August 1946, by "Kontrollratsgesetz No. 34" of the Allied Control Council. All weaponry, ammunition, and equipment delivered to Wehrmacht was subject to pre-delivery testing, inspection and acceptance. For communications equipment, this went down to the level modules and subassemblies ("Baugruppen") that were field-replaceable. These activities were the responsibility of the Heeresabnahmewesen, the Army Acceptance Organization. Acceptance inspections were performed according to "Abnahmebedingungen" (acceptance conditions), prepared by the respective "Waffenprüfämter" (e.g., WaPrüf 7 for telecommuniations equipment), the weapons test departments, or by the combined "Acceptance", "Chief Engineer", and "Development & Test" sections (see p. 20 in ref 1). Inspections were either performed on each individual item, or on samples. 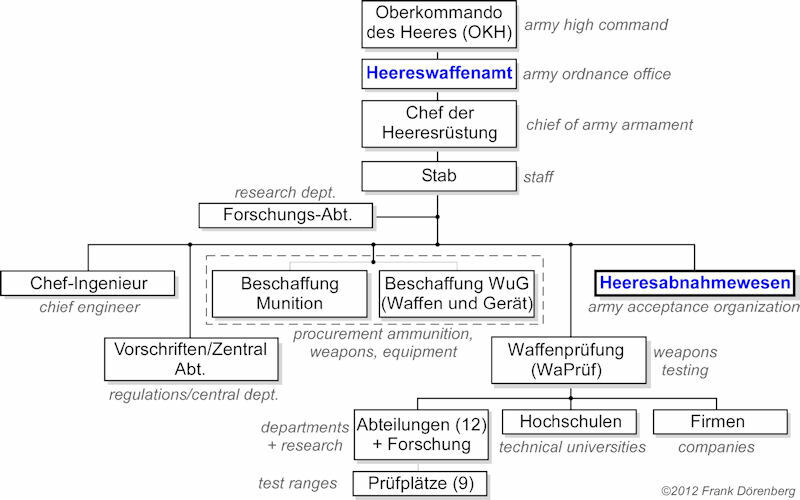 The organizational structure of the Heereswaffenamt was adapted over time (see section "B. Gliederung" in ref. 1, ref. 15), evolving with pre-war rearmament, sustenance of the war, and Wehrmacht politics. Through the early phases of the war, the procurement, testing, and acceptance organizations where hierarchically below the Chef-Ingenieur (WaChefIng, Chief Engineer, responsible for state-of-the-art designs and manufacturing). Later on, the latter was placed at the same level as those organizations. Army telecommunications equipment ("Nachrichtenmittel") were handled by the "Waffen und Gerät" (W.u.G.) office. A final reorganization attempt was made in February of 1945, when the Amt was already being dispersed from Berlin to northern and southern Germany. The Heereswaffenamt was supposed to be changed into Wehrmacht-Waffenamt. This only took effect on paper, though the Amt now actually did report to the Chef der Heeresrüstung, rather than the Oberbefehlshabers des Ersatzheeres. The dissolution of the Wehrmacht-Waffenamt took place over the period April 27 - May 2, 1945, on orders of the Chef der Wehrmachtrüstung. Ref. 18. Inspizienten: supervisory offices in Breslau, Berlin, Dresden, Hannover, Erfurt, Nürnberg (Nuremberg), Münster, Stuttgart, Berlin-Spandau, Wien (Vienna/Austria), Königsberg (now Kaliningrad), Radom (100 km south of Warsaw/Poland), Prague/Czechoslovakia, and Brussels/Belgium. Kommandos: units in Italy, Norway, Ukraine, and the Balkan. The Abnahmestellen were typically inspection stations that each covered multiple equipment suppliers and factories. They were often co-located with the factory of a major manufacturer, but not staffed by employees of that manufacturer. Note that the acceptance identification number does not represent an individual inspector, nor a specific inspection station. It belongs to a particular chief inspector, and all of his subordinate inspectors used the same number. If he moved to a different location, then the number moved with him. Ref. 17. Over the years, the Abnahmewesen of the army had mushroomed to an estimated staff of over 25000 individuals. Ca. 1942/1943 it was decided to change the acceptance process, and release a significant part of the acceptance/inspection staff for frontline duty. This reorganization was based on transferring the authority and responsibility for the acceptance of Wehrmacht goods to qualified personnel ("lizensierte Firmenprüfer") at the supplier companies. This is referred to as Betriebsabnahme (BA, ref. 8). With this process, it was the individual inspector who had an identification number, rather than the Abnahmestelle. Hence, a BA acceptance stamp (typically placed in an octagon) could have an inspector number with as many as five digits. 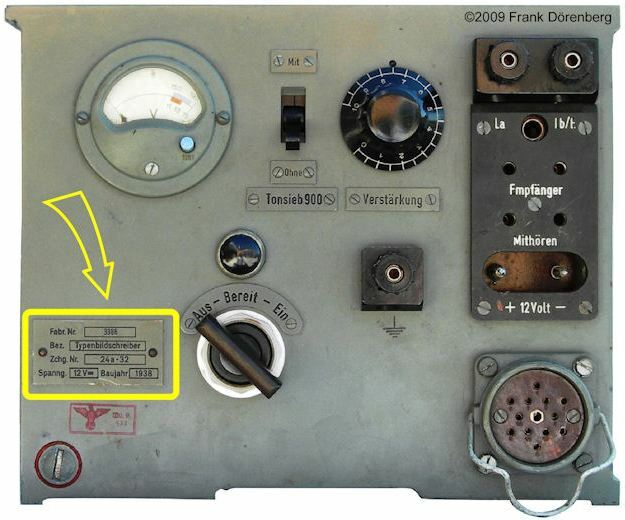 Telefunken/Berlin appears to have used a variation on the BA scheme, by using the marking "W.ab" or "W. Ab." - but without an inspector number. W.ab presumably stands for Werksabnahme, which basically means the same as Betriebsabnahme. The Reichskommissariat für die Luftfahrt (the Reich's Aviation Commissariat) was created in February of 1933. Two months later, it was changed into the Reichsluftfahrtministerium (RLM, ref. 15, 30), the German Air Ministry. The official (and short-lived) purpose of the RLM was planning and development of civil aviation. The following month, the RLM was expanded with the Luftschutzamt (the Air Defence Dept. ), and grew in importance and influence. In 1935, the Abteilung Flugtechnik (the Aeronautical Dept.) of the Heereswaffenamt was transferred to the RLM. Hence, the RLM had its own acceptance organization, the "BAL", subordinate to the Technisches Amt of the RLM. According to Luftwaffe service regulations, this stands for Bauaufsichten des Reichsluftfahrtministeriums (the Administration of the RLM for the Supervision of Construction, ref. 8, 13), in short "Bauaufsicht Luft". Some literature states that B.A.L. stands for Bauaufsichten der Luftwaffe, Bauaufsichts-Leitung, Beschaffungs-Amt für die Luftwaffe (air force procurement agency), or Bauleitung der Luftwaffe. The latter was actually a civil organization for the construction of Luftwaffe infrastructure such as airfields, and radar installations. The Kriegsmarine had its own Waffenamt: the Marinewaffenamt (MWa, see sheet 10 of ref. 30). It was established in October of 1934, and reported directly to the Oberbefehlshaber der Kriegsmarine (OB.d.M, Naval Supreme Commander). In November of 1939 it became the Marinewaffenhauptamt. For acceptance activities, it had a number of Abnahme-Inspizienten (Inspectors), mid-July 1943 combined into a single organization: the Marineabnahmeinspektion (M.Abn.I). This included the "Gruppe Nachrichtenwesen" (Signals Group). Note that the Kriegsmarine procured some equipment via the Heereswaffenamt (and vice versa), and this equipment may carry acceptance stamps of both organizations. In principle, all items (Waffen, Munition, Gerät - weapons, ammunition, equipment) accepted by the Wehrmacht received an Abnahmestempel (acceptance stamp) or a Prüfstempel (inspection/test stamp). Hence, this also applied to communications equipment, such as radios, modules and sub-assemblies (Baugruppen), vacuum tubes and other components, and accessories. The Abnahmestempel is either a Wa.A, BAL, or BA stamp - in each case with the number of the Abnahmestelle. Hence, the Hell Feldfernschreiber also bears such acceptance stamps. In principle, an acceptance stamp is placed on each of its field-replaceable units: the Motor-Generator, the Amplifier & Interconnect Unit (the electronics box), the printer box, the base unit (gear box and paper trays), the Keyboard/Character Drum unit, and the vacuum tubes (valves). Usually the carrying case ("Tornister") and the spare-parts box also have an acceptance stamp. Note that unscrupulous traders sometimes add bogus acceptance stamps to equipment, in an attempt to increase their market value. The Waffenamt ink stamps consist of the national socialist version (1935-45) of the Imperial Eagle ("Reichsadler"), the proper abbreviation "Wa.A." (sometimes "WaA" or "Wa. A. "), and the identification number of the chief-inspector. On Hellschreiber machines, the stamps are either red or black. The electronics box of one of the ca. 150 Feld-Hell machines in my database has a yellow stamp (see Fig. 41 below). The BAL stamp comprises the abbreviation "BAL" and a number. Both are usually placed inside an octagon, but sometimes inside a circle or square. Appendix of ref. 8 (pp. 31-35) provides the specifications for BAL steel marking punches (for weapons), rubber stamps, lead seal-presses, branding irons, documents stamps (rubber, and embossing), and accredited inspectors. The round connector at the lower right-hand corner of the amplifier box mates with a plug that has 11 signal pins and a keyed center pin. The connector and plug are actually borrowed from the Luftwaffe. They carry an Fl-number (Fl. 32620-1 for the "11 polige Steckerdose Bm.77.stp.16a" (or 16b, c) socket and 32620-2 for the matching "11-pol. Stecker Bm.77.stp.16a" (plug). So it is not surprising to find a BAL acceptance stamp on the connector. This implies that the connectors were accepted prior to installation in the amplifier box. The BAL stamps on the connector insert are typically accompanied by a date code stamp. Max G. Müller, Fabrik für Lederwaren und Heeresbedarf, in Nürnberg (Max M. Müller, Leather Goods and Army Necessities Factory, Nuremberg). Note: WaA 38 also appears on radio equipment such as Torn.E.b receivers and 5W.S.c transmitters ("5 Watt Sender"), ref. 17, as well as the small portable transceiver Kleinfunksprecher Kl.Fu.Spr. "Dorette" (depending on the actual manufacturer). WaA 130. Per ref. 2, this number is associated with products from Wilep IBB Industriebürsten GmbH in Berlin-Pankow. That company also made pioneer tools. WaA 239. I do not have a photo of this stamp on a Hellschreiber carrying case. The same number also appears on other carrying cases, such as that of Torn.E.b receivers made by Mende & Co. It is unclear who manufactured the cases. BAL 391. This number is associated with Siemens-Halske in Berlin, in particular for Hell Feldfernschreiber. WaA 448. I have not yet been able to identify this number. It also appears on leather holsters made by leather goods manufacturer Albin Scholle Lederwarenfabrik in Zeitz (35 km southeast of Leipzig). WaA 475. I have not yet been able to identify this number. 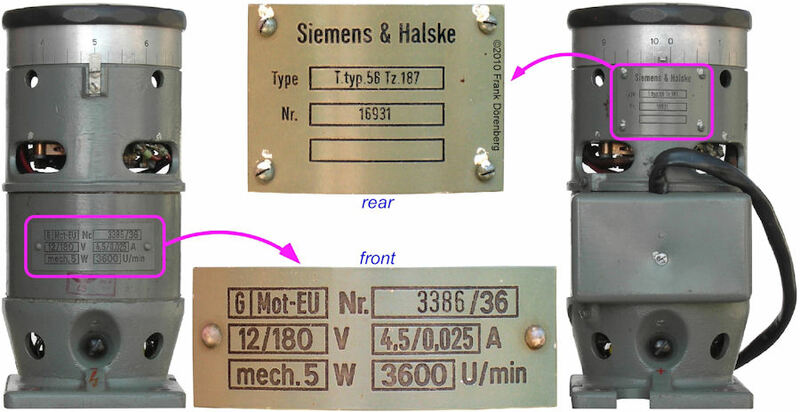 WaA 548: this number also appears on other items from Siemens-Halske, such as microphone elements (e.g., in the F.mph.25c), and Erdsprechgerät 11 Rel.trgb.9a. WaA 577. This number is associated with Siemens-Halske, probably in Erlangen. It also appears on TornFu.d2, TornFz.d2a, and Fprüf.c. (ref. 17), Dämpfungsmesser 39, Erdsprechgerät 11 Rel.trgb.9a, Kabelprüfer, and inside the Telefunken receiver KwEa. Paul Linke in Berlin-Tempelhof: similar products. AEG (e.g., connectors of heavy field cable "schweres Feldkabel"). Aktiengesellschaft Mix & Genest Telephon-, Telegraphen- und Blitzableiter-Fabrik of Berlin-Schöneberg (field telephones of type FF33; M&G (Emgefunk) became part of Standard Elektrizitäts-Gesellschaft AG / ITT in 1930. Apparatebau-Gesellschaft Neumann & Borm of Berlin-Schöneberg. 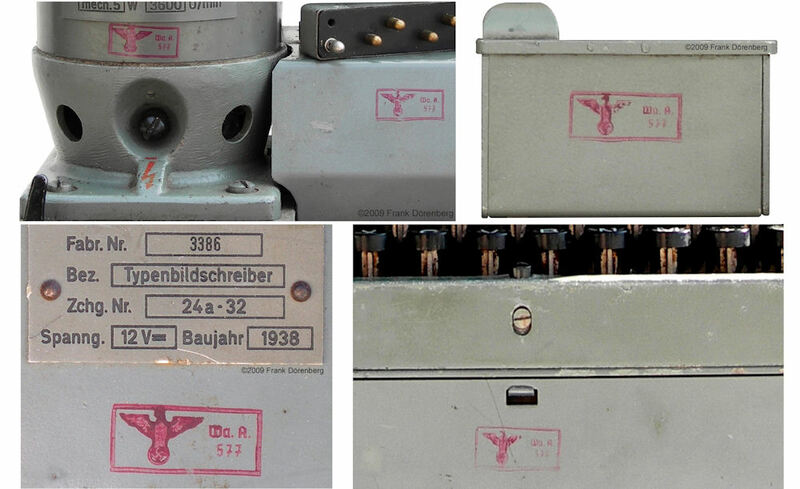 For the Wehrmacht, they made items such as time delay switches and acoustic proximity fuses for guided missiles, microphones, switching and cable distribution boxes. It also appears on items on Morse telegraphy keys ("Morsetaste"). BAL 776. 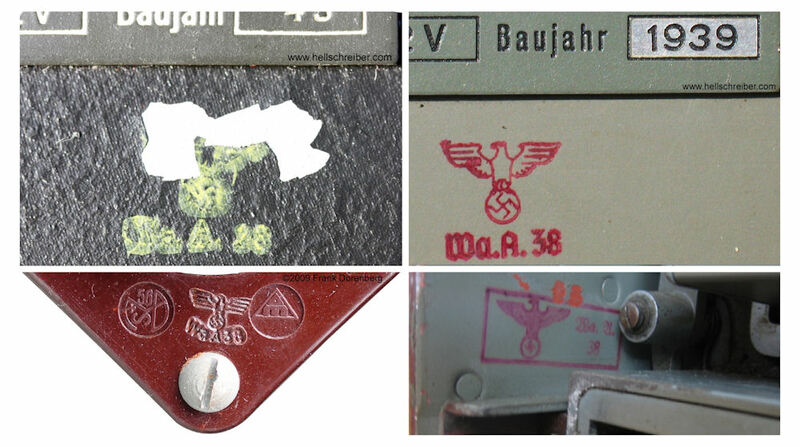 This number appears on equipment made by Siemens-Apparate- und Maschinenbau (SAM), such as a cable reel ("Leitungsaufroller") for Luftwaffe hand lamps. BAL 1072. This number also appears on the 12-pin plug made by Siemens-Apparate- und Maschinenbau (SAM), that mates with the Feld-Hell''s connector (and several aircraft equipment, incl. in the Messerschmhitt Me-262 jet fighter). vacuum tubes made by TeKaDe in Nürnberg. The full listings of the WaA numbers and their identifiers were lost during bombing raids in 1944 and 1945 (as was the majority of other Wa records). Listings available today, are typically incomplete, often inconsistent, and only covers weaponry and ammunition. However, ref. 17 contains a reconstructed listing for communications equipment. One unusual, nonstandard marking is the "Eschebach 1941" stamp on the inside of the lid of a Feld-Hell carrying case (see Fig. 50). That same lid has a WaA 38 stamp. WaA 38 is linked to numerous companies, including Metall- und Holzwarenfabrikation Vereinigte Eschebach'sche Werke AG (VEWAG) in Dresden and Radeberg. VEWAG was started in 1867 by Carl Eschebach, as a plumbing company. The factory in Dresden was sold off in 1931. 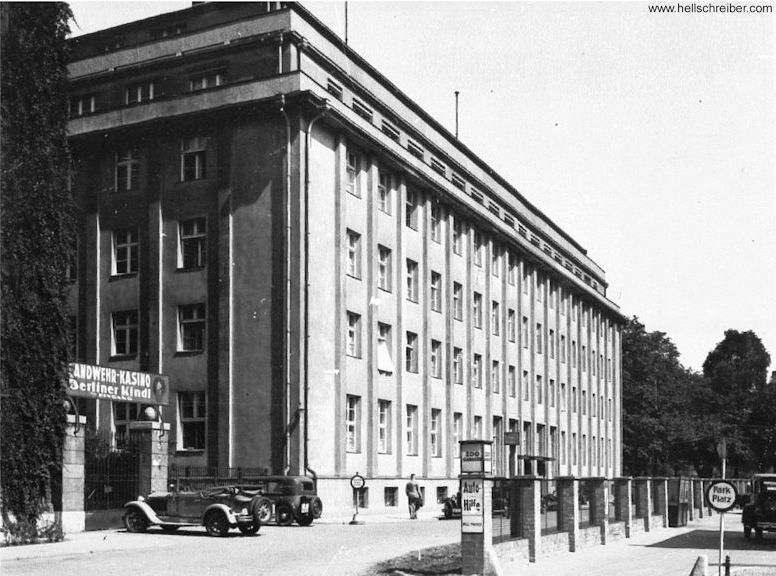 The Eschebach factory in Radeberg made all sorts of wooden and metal office furniture, kitchen and bathroom furniture and appliances, enameled and galvanized household items, as well as enclosures for radio equipment. The latter included carrying cases and lids (Tornistergehäuse (ref. 19), including for the Torn.E.b receiver (p. 62 in ref. 25, p. 24 in ref. 19). They also made gas mask canisters. 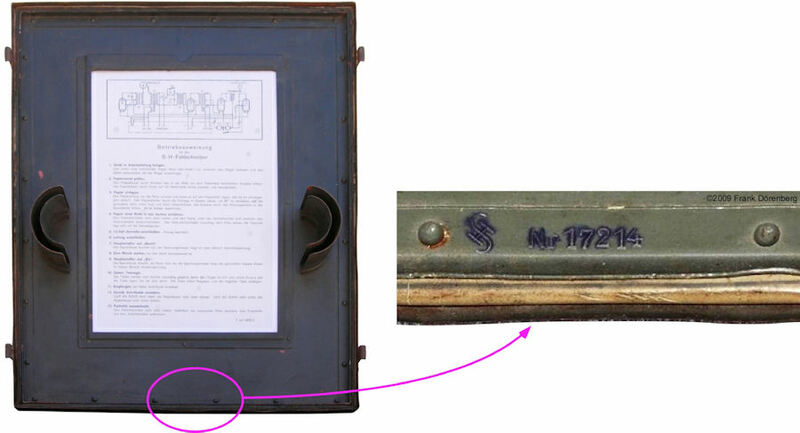 Another unusual marking is an magenta "MT 3" stamp on the base of some motor-generators; the stamp also appears on the inside (bottom, rear) of the electronics box of the some machines. Similar is an "A 60" stamp. Possibly, they are stamps of the manufacturer's internal quality assurance department. Ref. 6: "Liste der Fertigungskennzeichen für Waffen, Munition und Gerät", Pawlas Verlag, 1977, 782 pp. Note: this publication contains listings of Army and Luftwaffe Abnahmestellen, but the associated numbers do not correspond to the numbers found on acceptance stamps. Ref. 11: "Rundfunkindustrie in Dresden - Radio Mende und Funkwerk Dresden", Waldemar Ueberfuhr, March 2007, 3 pp. ; Appendix 5.1.1 to "VEB Robotron-Meßelektronik "Otto Schön" Dresden". Ref. 14A: "The Feldfernschreiber", the above D 758/1 "Der Feldfernschreiber" document, translated into English and annotated by me, Frank Dörenberg; updated 2 May 2009. Ref. 16: Fig. 27 (p. 67), 28 (p. 68), 30 (p. 82) in "German Research in World War II: an analysis of the conduct of research", Leslie Earl Simon, J. Wiley & Sons, Inc., 1947, 218 pp. Ref. 20: "Übersicht Deutsche WaA-Herstellerstempelungen", source: ? Ref. 26: p. 96, 308 in "Demontagen in der Sowjetischen Besatzungszone und Berlin 1945 bis 1948 - Sachthematisches Inventar" [pdf], Klaus Jochen Arnold, Brandenburgisches Landeshauptarchiv, Brandenburgisches Landeshauptarchiv, Potsdam, 2007, 467 pp. Ref. 28: pp. 219 in "Das SS-Helferinnenkorps: Ausbildung, Einsatz und Entnazifizierung der weiblichen Angehörigen der Waffen-SS 1942-1949", Jutta Mühlenberg, Hamburger Edition HIS Verlagsges. mbH, 2011, 575 pp. Ref. 29: "Verzeichnis der Fernschreibrufnamen der Fernschreiberstellen des OKW, die vom OKW zugeteilt sind (F.N.O.K.W. ), Teil I: Fernschreibrufnamen, Teil II Dienststellen"Fernschreibrufnamen", Oberkommando der Wehrmacht (OKW), Berlin, 1 July 1942, 70 pp., Prüf-Nr. 91, 70 pp. ; catalogue nr. LBY 90 / 553 of the UK Imperial War Museums. Ref. 30: "German Scientific Organisation", sheet 1-10 of Section 0.9 of A.L. No. 60 of Sub Committee for the Investigation of German Electronic and Scientific Organisation (SIGESO), 6/2/1946, Report Vol. 1, Part 2. Source: www.cdvandt.org. Ref. 33: personal communications with W. Thote, September 2012.